Do you know what you are taking? RCMP are asking for the public's assistance in identifying an unknown male who has committed frauds in both Grande Prairie and Hythe, AB. 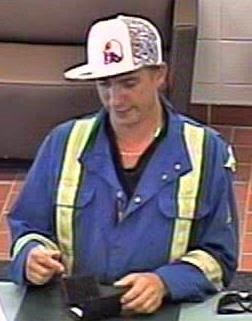 On June 25, 2014, an unknown male cashed a fraudulent Canada Revenue Agency cheque at a bank on the west side of Grande Prairie. The male produced false identification in the name of Adam Young to complete the transaction. 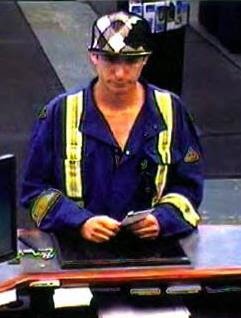 On June 26, 2014, the unknown male cashed another fraudulent Canada Revenue Agency cheque at a bank in Hythe, AB. He again produced false identification in the name of Adam Young. Police are asking anyone who has any information regarding the identity of the suspect male to please contact the Grande Prairie RCMP at 780-830-5701 or call Crime Stoppers at 1-800-222-8477 (TIPS). Grande Prairie RCMP are investigating a break and enter and theft of copper wire which occurred from a business on the west side of Grande Prairie on August 8, 2014. Sometime between 2:45 a.m. and 3:00 a.m. on August 8, 2014, at least 2 unknown suspects broke into a business' fenced yard, loaded $200,000.00 worth of copper cable onto 2 separate trucks and then left the scene in an unknown direction. 1. ^ Early 90's GMC pickup pulling a small flat deck trailer, blue in colour with white on the roof and truck bed. 2. ^ Late 2000's GMC/Chev crew cab pickup with the left rear tail light burnt out, two-toned in colour. If you have any information about this or any other crime(s), please call the Grande Prairie RCMP detachment at 780-830-5700. If you wish to remain anonymous, you can contact Crime Stoppers at 1-800-222-8477 (TIPS). On August 25, 2014 at approximately 4:00 pm, Provost RCMP officers received a call regarding a possible plane that went down in a field approximately 2 km south of Provost off Highway 600. Provost RCMP officers attended and found the body of the pilot and sole occupant trapped upside down in the small aircraft. The provost fire and rescue as well as EMS were on scene shortly after to assist officers. The identity of the deceased will not be shared, however officers can say that he was a 75-year-old male from the Calgary area. The cause of the accident is unknown at this time. The aircraft was an amateur built BEDE - Model BD5B. The Edmonton Medical Examiner's Office has been notified and has authorized transportation of the deceased to their office for further examination. Next of Kin of the deceased has been notified. Transport Safety Board have been notified and have deployed a team of investigators. Just after midnight, Tuesday August 26th, 2014, Airdrie Rural RCMP responded to a serious motor vehicle collision on Highway #2 just north of Highway 566 near Balzac, involving a pickup truck and a pedestrian. Immediately after the collision, two employees from STARS Air Ambulance came across the scene and began emergency first aid on the 16 year old male pedestrian from Airdrie. Airdrie RCMP, Rocky View Fire Services, Provincial Emergency Medical Services and an RCMP Collision Analyst attended the scene. Initial investigation has revealed that a Ford F150 pickup, driven by a resident of Airdrie, was travelling north bound on Highway #2 in the middle of three lanes just north of the Highway 566 overpass when the pedestrian, wearing dark coloured clothing, was struck. It appears the 16 year old pedestrian may have had mechanical difficulties with his vehicle, which was found nearby. Tragically, the pedestrian was pronounced dead at the scene. No charges are being considered. Neither alcohol nor speed appear to have been a factor in this collision. North bound lanes of Highway #2 were closed for four hours while police investigated the scene. The roadway is now open to traffic. The RCMP would like to thank motorists for their patience and co-operation regarding traffic delays in this unfortunate event. At approximately 2:11 am on 26 August, 2014, Airdrie RCMP responded to a armed robbery at the Mac’s convenience store on Summerfield Blvd. A male entered the store, pointed a firearm at the clerk and demanded money and cigarettes. The clerk complied and the suspect fled on foot with an undisclosed amount of cash and cigarettes. There were no customers in the store at the time. RCMP Police Dog Services and Airdrie RCMP Rural members attended to assist. RCMP Forensic Identification Services will also be assisting with the investigation. · Wearing a light blue bandana, black toque, dark glasses, grey long-sleeve hoodie, and black pants. The suspect fled on foot and no vehicle was seen. No one was injured in this event. Airdrie RCMP responded to several vehicle thefts on the early morning of August 26th, 2014. 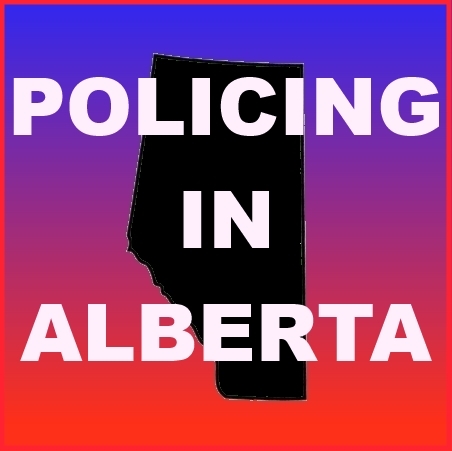 At approximately 2:20 am, RCMP received a call of a male and female attempting to steal a vehicle in the Big Springs neighbourhood of Airdrie. Police attended and surrounded a vehicle. The driver ignored commands and evaded police, nearly striking a member with the vehicle. A stolen vehicle was left on scene, and seized by RCMP. Other vehicles in the area were found to have had their plates stolen. Slip tank in the back. Airdrie RCMP also responded to an alarm call at Airdrie Towing and Logistics at approximately 5:05 am. Thieves entered a locked garage in the tow yard and removed a F-250 Truck, driving through the security gate on the way out. Later at approximately 5:15 am, In the Meadowbrook neighbourhood, a member of the public witnessed what he believed to be a Break and Enter to residence in progress. When the witness called police, a male and female suspect stole the vehicle he had been travelling in which was parked nearby. RCMP was dispatched but was unable to locate the vehicle. Airdrie General Investigative Section and Crime Reduction Unit along with Airdrie RCMP City members continue to investigate. RCMP are requesting anyone with information to contact the Airdrie RCMP at 403-945-7200. Over the past several months, the Wood Buffalo RCMP has noticed a rise in the sudden deaths of individuals suspected to have died as a result of a drug overdose. To protect the integrity of the ongoing investigations, police will not be speaking on specific details pertaining to the deaths, but they would like to remind everyone of the dangers associated with drug usage. Although these types of deaths are not a common occurrence within the Regional Municipality of Wood Buffalo and they seem to take place more often in larger urban centers within our country. The term ‘Polypharmacy Toxicity’ which is defined as an unnatural cause of death, is often used by medical examiners to describe a death due to the simultaneous use of multiple drugs whether they are prescription, over the counter, illegal or some other combination. Wood Buffalo RCMP and its’ partners strive to make our communities a safe place not only through enforcement but through education as well. Red Deer RCMP have arrested a man for the stabbing incident that took place on the CN walking bridge in Red Deer on July 5, 2014. Marlo Thomas was remanded in custody and appears in court at 9:30 am today, August 26, in Alberta Provincial Court in Red Deer. - 2 Racing Related charges. Other numerous charges were laid including suspended drivers, no insurance, suspensions, and the execution of outstanding warrants. The “tip of the day” from RCMP Traffic Services relates to School Bus Safety. School will be back in soon which means school busses will be on the road too. When you see the school bus with the yellow lights activated, it means the bus is slowing and will soon stop. You should do the same. The Calgary Police Service would like to thank the public with their assistance in identifying a man that may have information about a weekend shooting that left one person dead. All four men have been interviewed. Three of the individuals have been released. The fourth man, wanted for attempted murder on a Canada wide warrant is still in custody. The Calgary Police Service has arrested four youth in connection with numerous car prowlings in the Riverbend area, and are seeking public assistance to return the stolen property to the rightful owners. Sometime between 1:40 am and 2:40 am Tuesday, August 26, 2014, police were called to the Riverbend area for reports of car prowlings. With assistance from HAWCS, officers from District 6 were able to apprehend four 16-year-old boys. The boys had numerous personal items in their possession, believed to have been taken from vehicles in the area. Citizens are always encouraged to report car prowlings or suspicious activity to police. This not only helps direct resources to problem areas, but also facilitates the return of stolen property to rightful owners. The Edmonton Police Service is seeking witnesses to an incident which occurred in downtown Edmonton on August 23, 2014 that left a man in hospital with life threatening injuries. Emergency Medical Services responded to the area of 101 Street and 104 Avenue at approximately 9 p.m. on Saturday. It was reported that a male sustained serious head injuries during an alleged physical altercation that occurred on the sidewalk and roadway close to a downtown office building and bus shelter. Upon arrival, EMS found a 49-year-old male in physical distress. The male was treated and rushed to hospital by EMS with life threatening injuries, where he remains in critical but stable condition. Downtown Division officers believe there were witnesses to the incident. Anyone who has information about this crime is asked to contact the EPS at 780-423-4567 or #377 from a mobile phone. Anonymous information can also be submitted to Crime Stoppers at 1-800-222-8477 or online at www.tipsubmit.com/start.htm.